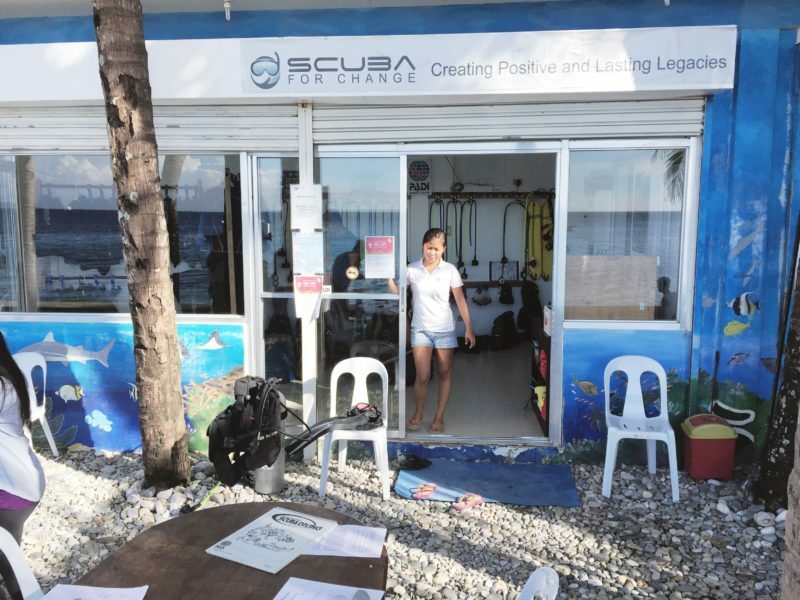 On the 18th of February, I and my blogger friends went on a dive for a cause with Scuba for Change, a not-for-profit dive center and a unique social enterprise scuba diving business in Puerto Galera. SFC’s initiatives include funding programs to help fight child exploitation and developing skills of the locals to give them opportunity to manage and operate all of SFC’s operations. 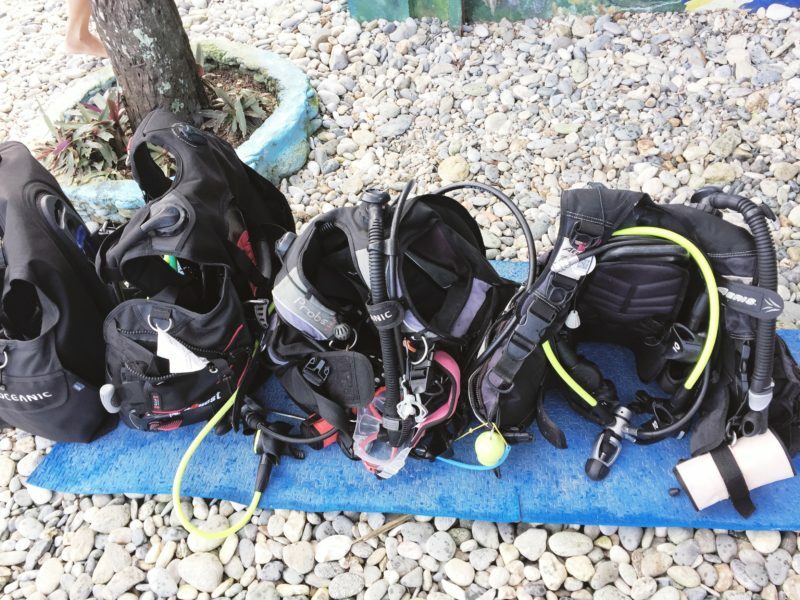 SFC’s dive center is located at Tamaraw Beach Resort, Aninuan Beach. They offer dive trips and scuba courses led by their PADI-certified scuba diving instructors. SFC’s profits are used to provide children and business grants, staff profit share, as well as to prepare for the organization’s future expansion in developing countries. 50% of Scuba for Change’s profits goes to its main beneficiary, Stairway Foundation. 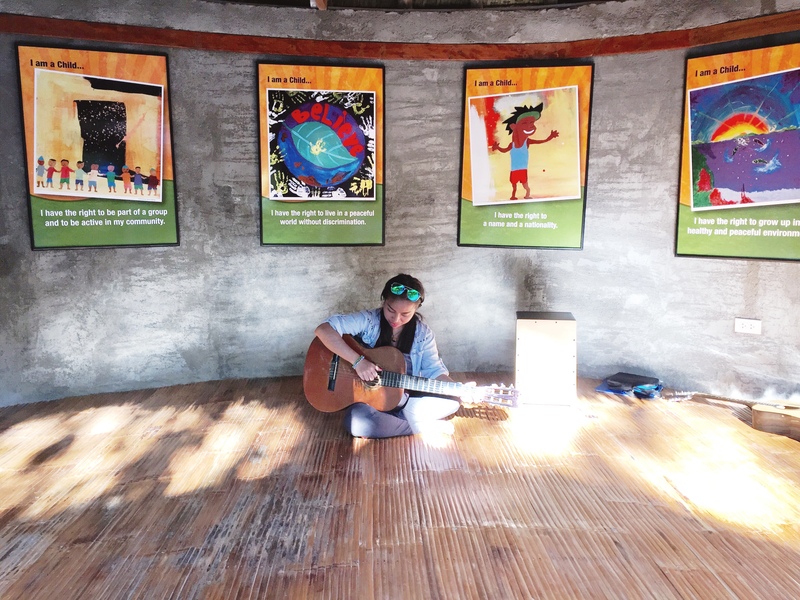 Stairway is a non-stock, non-profit, non-government child care organization in Puerto Galera. It was built in 1990 by Lars C. Jorgensen and Monica D. Ray as an alternative program for the most marginalized and abused street-children in the Philippines. Break the Silence – An advocacy to prevent child sexual abuse, which involves capacity building and networking to increase awareness of the issues from ground level (children, families, and communities) to government departments [Department of Social Welfare & Development (DSWD) and the Department of Education (DepEd)], and with a strong focus on training and sensitizing the national police, social workers, teachers, along with multiple non-government organizations (NGOs). The Break the Silence Network counts more than 50 civil society organizations nationwide. Environmental Awareness for Children and Youth (EACY) – this initiative aims to inspire and educate school children to better appreciate and protect the beautiful and vulnerable environment that they live in. Youth for Change – A venue for building relationships between Stairway kids and more privileged youth from schools in the Philippines, Singapore, Korea, Egypt, India, USA, and Denmark. Because it was a Saturday, meaning I went to the trip straight from work, I was practically comatose come afternoon. We went to a house for dinner and as we waited, I tried to catch some zzs on the living room while my companions were busy chattering in the background. I heard them clamoring for coffee and being the coffee person that I am, there is no way I wouldn’t get a cup. Turns out the coffee is provided by Monkeyspeak Coffee, a supplier that produces coffee solution, such as coffee capsule, coffee machine, and electric milk frother/warmer. Their coffee is 100% pure arabica from the best specialty coffee growers around the world. Likewise, they have local partners that produce the best quality Arabica and Liberica (barako) beans. I was able to try their cafe latte, so good it knocked my eyes open. If you want to place an order or general inquiry to Monkeyspeak Coffee, go this link. When it was my turn, I had forgotten the first skill; breathing through the regulator. Guess I shouldn’t be too cocky . It took 3 tries before I was able to get it right. Soon after, we were out in the sea to do the actual diving. I was both nervous and excited, I mean, this is it, I was going to dive underwater. I’m going to see some fish and corals instead of swimming pool tiles! I was on the second batch so I had to wait for my turn. Moments later, I was already suffering from seasickness. Twice I threw up, which had my companions worried. I remember feeling this way just before I did the parasailing activity in Boracay. And just like in Boracay, I didn’t let my seasickness get in the way of fun. I am pretty determined to continue with the dive despite my queasy stomach. The first batch complained about blurry water and practically seeing nothing underwater so the boatman steered the boat to another location for the second batch. Because of my seasickness, I was the first to go to the water. I sat on the edge of the boat, they told me to place a hand on my mask and the other on my chest. They counted from 1 to 3 then pushed me off the boat. I plummeted head first down the water. Soon I was floating on the surface with the help of the BCD that I’m wearing. Gracian, one of the dive instructors of SFC was assigned to assist me. Slowly I pressed the BCD deflator button to sink in the water. Immediately I felt the pressure on my ears and had to equalize by pressing my nose. No sooner than I did, the water made its way inside my mask making me scared out of my wits. In my panic I have forgotten what they taught us about mask clearing and so I scrambled up to the surface. I took a deep breath and did it for the second time. The attempt was a lot worse than the first. Again, the water made its way inside my mask. I frantically used the “out-of-air” signal instead of the “ascend” or the “something is wrong” sign. Nevertheless, the diving instructor led me to the surface. Immediately, I removed the regulator from my mouth and gasped for air, gulping sea water in the process. The salty water reached the back of my throat inducing a retching fit. I looked up and saw one of my friends going back to the boat saying over and over that diving is not her calling. “Does it have to be one’s calling to learn scuba diving? I think not.” But it was my second attempt to go under to no avail so I questioned myself for doing this. Gracian told me to try once more. I cut him a look and wondered what is wrong with him. Can’t he see that I’m bad at it? Was it not obvious that I am struggling? “You can do it. If you try again and fail then we can go back to the boat,” he said. Somehow, the promise that it’s okay to quit after a third try calmed me down and convinced me to do it one more time; a decision that I would not regret. My friend, Pipay, lent me her mask, which solved the mask situation. This time I was able to equalize with ease, no more water getting inside the mask, yay! Honestly though, I was still uncomfortable and a little paranoid so I held on to Pipay’s hand the entire time while Gracian guided me on the other side. Through my foggy mask I gazed over the world down below where time seems to stop. I watched in fascination as fishes of varied species and colors swim by. I stood in awe of coral reefs covering the sea floor, some were swaying ever so gently like a silent welcome. Everything looks surreal, and everything is so calm. At one point we swam so deep I was afraid of grazing over the corals, then I realized that looking through the mask may have made it appear like we were closer to them than we really are. The view takes my breath away, of this world so different from us. How many times do we get to see this marvelous world in our lifetime? Certainly not a lot. Yes, the beginning is a struggle, but it’s a reminder that great things are not supposed to be easy. That if you hold on just a little bit more, your effort will be worth it. And the beauty of this experience does not merely lie on the marvelous opportunity to dive but also from the fact that Scuba for Change is giving some locals a source of livelihood and a foundation a means to support and save children who are victims of abuse. And now we want to help them get the word out, to encourage everyone to be part of their noble endeavors. Grand Prize: Open Water or Advanced Open Water PADI certification. Moreover, you are welcome to join our dive for a cause with Scuba for Change happening on the 29th of April, which coincides with the grand raffle draw and the fundraising event. For more information, contact Scuba For Change Dive Centre or Laarni de Lara through her Facebook page, Lady from the Mountain in the City. Likewise, you may contact me directly at coffeehan2010@gmail.com. Combination of two great things: diving and a great cause! What an inspirational company! Glad you got to be a part of this! 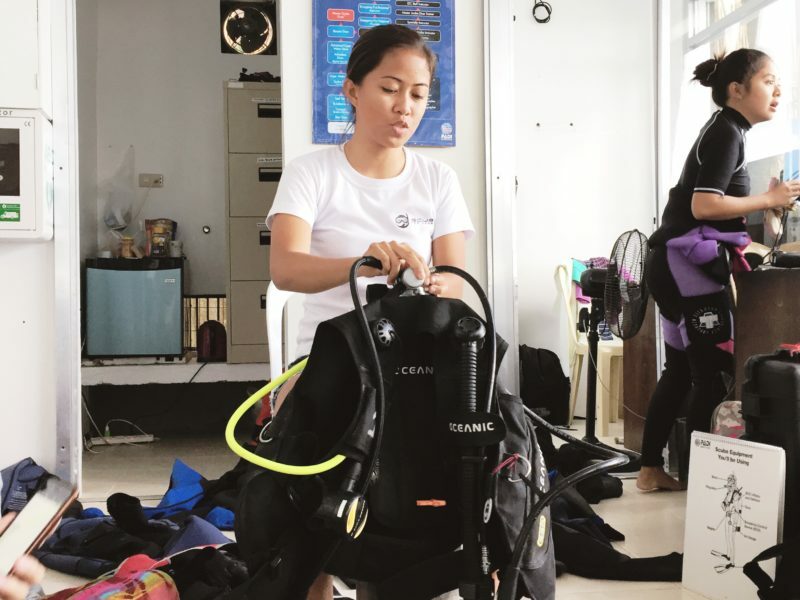 We need more organizations like Scuba Dive that has direct goal targeted to help give direction to kids that lack in such aspect of life and more. I’d dive for this cause! Scuba diving is a really thrilling experience and especially so in the pristine waters of the Philippines. Add to that the fact that it is for a cause, the activity assumes more meaning. The fact that the ultimate beneficiaries of the event are children is a happy thought. I am sure bringing a smile on a child’s face must rank amongst the best experiences of life..
Wow! You were there for such a noble cause. I just hope it achieves lots of success, provides job to the locals and support children. Scuba diving is actually such a beautiful adventure where you are all together in a different world. I have faced the similar situation like yours in Thailand. But the difference is I gave up during my first try and you tried thrice and was able to do it. Had I been there I would have joined you guys! Im deathly scared of the underwater but of course, we have to go out of our comfort zone, right? Glad you didnt give up! Hopefully we can dive together in the future. I always admire your advocacies, Marge! I wish I know how to dive to see the world down there. Keep it up! Wow, this is such a great experience. Truly, scuba diving is really awesome as we get to appreciate the very deep nature of our planet that is hidden underneath the ocean. Anyway, I’m glad that there is this mind of dive for a cause, you’re not just going to enjoy the beauty of the ocean, but you get the chance to help the foundation as well. I love to try their 100% pure arabica coffee, I haven’t tried it yet. Thank you so much for sharing your experience with us Marge. I should really learn how to swim so I could try scuba dive next time. I read this in a couple of other blogs too. Good amount of awareness created through blogs. It is a noble deed, and I wish it all success. How is the underwater world in Puerto Galera? Makes me want to dive! Such a wonderful advocacy! 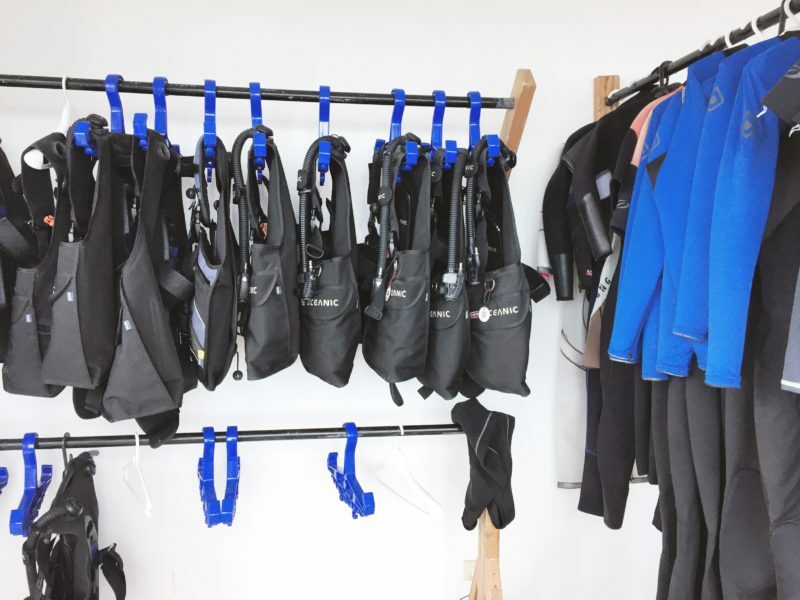 It’s definitely a must try for beginners – they can learn how to scuba dive and at the same time, they can help others. Also, I commend you for never giving up on scuba diving! I too get paranoid when i’m at sea but it would nice to explore new hobbies, don’t you think? Cheers! Awesome, scuba diving for a cause. I appreciate your spirit of persuasion. Loved reading your experience. I remembered my own initial swimming classes. I was scared to death that I am going to drown and die in 2 feet water ;-). Though I did overcame it. I can’t wait to go back to PG for the next event. I hope that would be my second chance to try scuba diving! hahaha so proud of you Marge you made it! Hindi mo nga lang nakasama ng matagal ang mga fishy fishy. Did you even find nemo or dori there? hahaha This is such an inspiring activity for us. I mean, we’re amazing! We help and do good things! Cheers! One can only admire a person such as yourself that pushed through to victory on your scuba dive, in spite of your sea-sickness and initial difficulties when entering the water. The support of the two professionals who reassured you and maintained their encouragement obviously made a huge difference. So well done! And also it is really great that you are supporting such a worthwhile charity and I hope you raise a lot of much needed funds to help their cause. Haven’t heard of this before. But I’m glad you guys did it! And I salute each one of you for doing it.